Another day another country giving us a metal band. 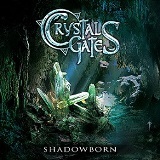 I don’t believe I have heard a band from Uruguay before, but with Crystal Gates quick single Shadowborn it is about to change. With a pair of tracks spanning mere 7 min Crystal Gates presents well rounded speedy melodic power metal, somewhat on the symphonic side, somewhere between Nightwish and Kamelot before either act became overly symphonic in their grandeur. Keyboards blend in nicely on the title track, and guitars shine with obligatory solos. Melodies soar and chorus is big and fiery, but of course the opinion whether such metal is fantastically engaging and uplifting or a bowl of hot cheese will split metal loving audience exactly in half. Crystal Gates are trying not to succumb to the softer side of things and even their ballad Dreamers grows into a full bodied track. The vocals, an important aspect for this metal style, for me anyway, are handled by one Caroline Perez. Powerful and pleasant she is more Tara Turunen than Annette Olzon with her soprano, yet there are a few moments when an adult yields to a little girl, especially on Dreamers. I listened to Shadowburn a couple of times, it is so short, and found myself enjoying its short duration. Good luck to the band trying to grow further.